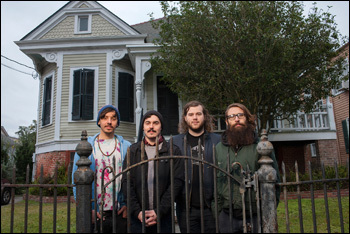 All People are a four piece band out of New Orleans, Louisiana who are committed to taking their sounds and ideas beyond the reaches of their hometown. On Tuesday May 5th 2015, they will release their second full-length album of organ driven melodic post-punk, “Learn Forget Repeat” via Asian Man Records in conjunction with on their own DIY label — Community Records. “Learn Forget Repeat” invokes some of the aggressive sounds of the early ‘90s — taking influence from Fugazi and late-era Jawbreaker along with melody and chord structure absorbed from their hometown. All People tours in an eco-friendly diesel engine van that is powered by waste vegetable oil and have completed over 150 tour dates since summer of 2013.